Hong Kong has a very strong Italian dining scene – need we even mention 8 ½ Otto e Mezzo Bombana was the first Italian restaurant outside of Italy to receive three Michelin stars? However, there’s a shortage of homegrown chefs making a similar mark. Newcomer Involtini ups the game in a big way – we’re talking cut and cooked to order pasta, fresh-picked herbs and, amazingly, not a single shaving of truffle or gratuitous slab of sea urchin in sight. The craftsmanship on show here shouldn’t come as a surprise – executive chef Jack Law previously served under the tutelage of no less a name than Umberto Bombana, from the aforementioned star-spangled establishment. The menu is beautifully brief – six appetisers, five pastas and four mains – and we start with a warm octopus salad ($135). 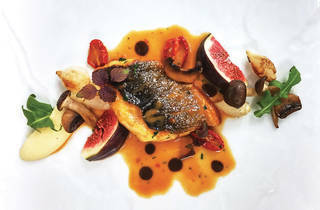 A vacuum-sealed, Tetris-like slab of octopus is smothered in a vinegar reduction before being torched and plated next to a strip of purple potato purée topped with sesame, quinoa and olive oil. It looks beautiful, but we’re disappointed by the lack of seasoning on the protein, meaning the accompanying salad also doesn’t sing like we’d like it to. The braised short rib and M5 Wagyu sirloin ($295) rectifies the situation in the best possible way. The quality of the beef is sublime and the bed of creamy mash and stewed baby onions brings out the meat’s natural elements. 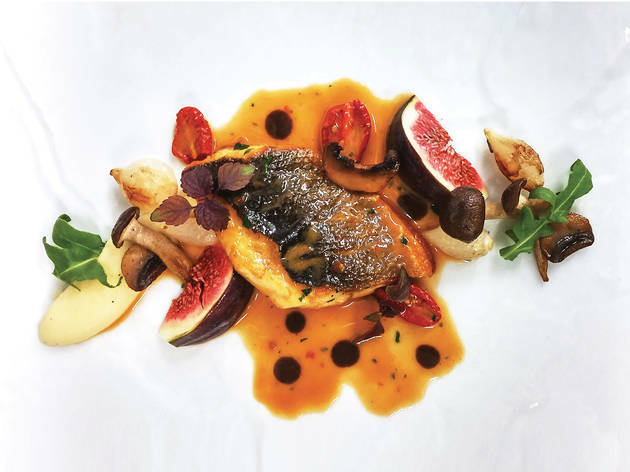 Elsewhere, the peskiest of pescetarians will love the sea bass ($215), which is expertly pan-fried and served with roasted mushroom and figs and topped with a luxe seafood butter sauce. It’s the sort of creativity that would make Bombana proud.